I looked up your VIN, your vehicle is using the same OS used on our test vehicle in Australia, so you will be supported in our first release. EGR wasn't in our proof of concept testing last week, but should be available in future test releases and our first public release. Thanks a lot pls let me know for any updates..Im very interested of buying one. 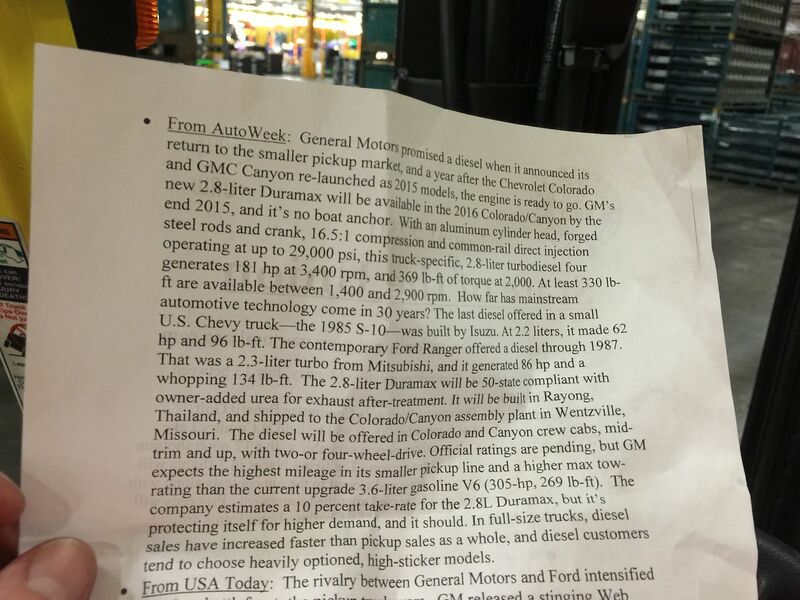 Yesterday I seen a report from GM that they started production of the U.S. bound engine yesterday. Users are encouraged to submit read files to ensure their OS is mapped for our first tuning release. We have them here at the plant just some testing before release. I'll test one for you! I'll see if I can get around one without being watched. There built on the line then pulled off and taken to our launch team center private garage we use our id to get into. Do we know what fuel system the 2.8 Duramax (pump, etc.) uses? Initial info says pressure in the common rail is 29,000 lbs? If it's Denso, are they prone to the same problems that Bosch has had? 2015 Silverado (Duramax) 4X4 Mostly stock, but upgrades are already being planned. Mike, any info on the 8 speed supposedly coming out in the Colorado, what trans is it, what's available for it performance wise, Is it any good, is it worth waiting for or is the 6 speed better, any word if it will come out in the 2018 model year Colorado? https://www.youtube.com/watch?v=Wfv5k17M9AM I'll just leave this here for now. That is a 1.9L, It is the most common race truck in Thailand. ECU shop has the fastest/quickest in class at a high 7.1 IIRC? Anyone modified the new Colorado diesel?..if so what did you do to it and how did it work out. Just bought the wife a 2018.